A review of Tim's keynote at the HfS FORA Summit in New York. “How to Thrive in the Robotic Age Without Losing Your Humanity“ was not your typical bloated enterprise keynote. In around 30 minutes, Tim Leberecht jolted an audience of operations experts at HfS FORA New York City. Though I have some minor intellectual quarrels with Leberecht (more on that in a bit), he places machines and humans at a crossroads we need to reckon with. He also has unusual advice for enterprises, with an unexpected concept – bringing romance to business. Leberecht, who is the Co-Founder and Co-CEO of The Business Romantic Society, has honed his thinking via a bestselling book on the business of romance, and a highly viewed TED talk. I kind of feel like I’m in the lion’s den. It’s hard. It’s hard to find that beauty and romance in business. Partly because many of us are stuck in corporate structures that stifle creativity, stifle self-expression and purpose. Romance is, for me, experiences of awe and wonder. Experiences in which a heart beats faster. We dreamt of a more democratized world where everybody was connected. And what did we get? Facebook. Over for the past few years, something else has happened. AI is no longer just an analytical force to be reckoned with that’s focused on process optimization. It’s now also invading turf that we actually had considered inherently human. Emotions and creativity. We have reason to be worried. AI industry impact slide from the World Economic Forum web site. AI is not going replace humans. AI is going to replace those humans who cannot work with AI. What is more concerning, I believe, is in our desperate attempt to catch up with ever-smarter machines, that are more efficient than us naturally, we turn into smart machines ourselves. We surrender to this regime of efficiency to self-optimization. Quantifying everything in order to maximize it and optimize it. And this obsession with the quantification and the optimization of everything has infiltrated the most intimate, the most private aspects of our life. He pointed to a humorous example, an app called Spreadsheets “that promises users to enhance their sexual performance based on a rigorous analysis of past performances.” A more unnerving example: the Don’t Worry, Be Happy writing app that tracks your facial expressions. If you stop smiling while working, it deletes all the progress you’ve made over the last hour. (I would have had to start over a few times already). We need a new romantic movement. This time coming from the heart of business. This time in response to the disenchantment caused by the datafication, quantification, the machinization of everything. Romance is what makes us human against a backdrop of automation and AI. And romance is also the ultimate differentiator when everybody else is just racing to maximize and automate. You may have seen it a few weeks ago where Ma made a real pledge for a new emotional education. And he said, the skills we really need are emotional skills. We cannot teach our kids to compete with the machines which are smarter. We have to teach our kids something: you need love – something that machines will never have. How do you operationalize romance? suffer – Perhaps the least business-friendly concept of the four. “I’m sorry to break it to you, romance is not identical with convenience, it’s not harmony, it’s not happiness. If you have skin in the game, there’s a dark side to it. We suffer a little.” Leberecht concedes that ultra-convenience, like Amazon one-hour delivery, is a big part of what businesses are driving for. But he says what customers really crave are experiences – and those have rough edges. That’s why we’ll wait in line for a chance to look at Amazon Go – a line-free store. “There’s only one thing that trumps efficiency and convenience, which is experience. Humans crave experience.” Leberecht made a provocative point about designing mistakes and flaws into your experience to make your brand more human. Humans shouldn’t try to do what machines do well at scale – agreed. Humans should excel at working with machines, but they should also view automation as an opportunity to “become more human,” if that shorthand works. Machines are taking over many things we associate as human – yes and no. Repetitive, predictable, and/or high scale work? Definitely. Other stuff? Gradual at best. I thought Leberecht’s Beatles example worked against him, proving that creativity is an area where humans still have a distinct edge. Yes, machines can make something that approximates a Beatles song, and it might be acceptable enough to sneak into a Walmart playlist, but how many are actually listening to it on their iPhones? If we’re talking about romance and love, I think we can also talk about soul. That machine song has no soul; Beatles songs do. Soul glues us to moments in time we would never trade, and if businesses need more of that – which I believe they do – only humans can help them there. Machines might be able to help with call center hold music though. Machine’s can’t love – no, nowhere close yet, but can they simulate love on behalf of their human subjects? Example: in a recent survey of Alexa users, a surprising percentage said they considered Alexa a “friend,” and Alexa is pretty tone deaf emotionally. At this early phase of “general AI,” I’ve appreciated the loyal companionship machines can provide – far more than their ability to mimic Beatles or black metal songs. I believe emotional intimacy – as defined by the human who is interacting with the machine – is a much lower bar for machines to achieve than truly compelling creativity. Whether it’s healthy for me to have an emotional connection to my old GPS with the sarcastic Daria voice, or whether it’s healthy for men to date an app called Rinko instead of a real woman – that’s a different conversation. The point is that it’s already feasible. As for loving someone/something who doesn’t truly love you back, well, that’s the epitome of romance for many. Companies are too stifling and quant-obsessed. Give diverse voices a platform. Hire humans with a creative/humanities flair to spark new ideas. Yep. Design mistakes and flaws into your brand to humanize it. Not sure about that – brands make enough mistakes as it is. Leberecht is right, but we humanize our brand by how we respond to those mistakes (see: KFC’s self-deprecating and forthright apology for their chicken shortage crisis). I like the idea of bringing romance to business – if I stick with how Leberecht defines it, in terms of awe and wonder. I define romanticism in a more tragic way, and businesses really can’t stomach the tragic. However, I don’t like the idea of encouraging individual humans to be more romantic. Right now, I’d like to see humans become less emotionally preoccupied, and significantly more media literate. True critical thinking is what’s missing today. 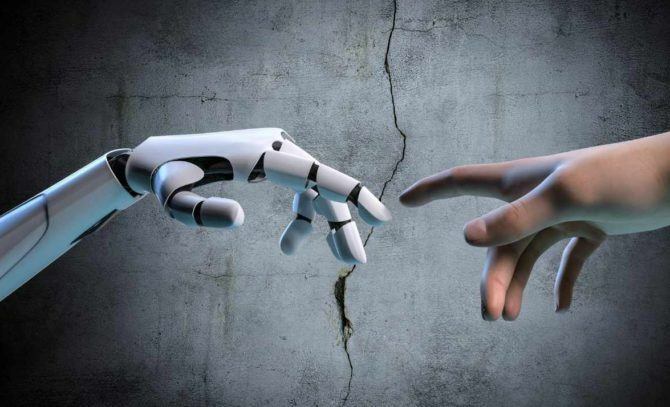 There’s a beautiful quote by the author F. Scott Fitzgerald, “The sign of a first rate intelligence is the ability to hold two opposing ideas in mind at the same time and still retain the ability to function.” Is AI good at that? Not sure. Humans are very good at that. Yes, humans can be very good at that. But are we? The American political discourse certainly implies otherwise. We categorically reject as “fake news” that which we disagree with – a sham of true critical inquiry (and self-inquiry). If we don’t make a serious effort here, I could see machines having a higher tolerance for ambiguity than humans in the not-too-distant future. To be fair, Leberecht did mention critical thinking as one of the skills humans should aspire to. But I would elevate it. I like the business-as-romance model, not as a boilerplate, but as a welcome debate. And as for hiring more liberal arts/humanities grads, I only wish that message was out when I was pounding the pavement in the 1990s. But as Leberecht would say, suffering leads to irreplaceable experience. WEF screen shots from the keynote are credited above. This article appeared originally on Diginomica.com.